With some extra cranberry sauce leftover from Thanksgiving and some chicken breast, I tried out this recipe that I seen online and really liked the twist of flavors. 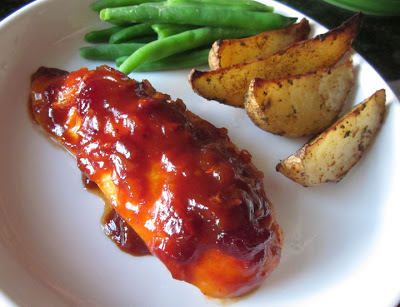 The sauce would be great on shrimp too or even as a dip for chips and pretzels. In a small saucepan, Whisk Cranberry Sauce, Wine, Soy Sauce, Garlic, Ginger and Pepper. In a large bowl, Dredge chicken lightly in flour to give a light breading to the Chicken. In a large frying pan, melt butter over medium-high heat until hot. Add chicken and sauté for 5 minutes. Turn over and continue cooking for 5 minutes more or until chicken is cooked through. 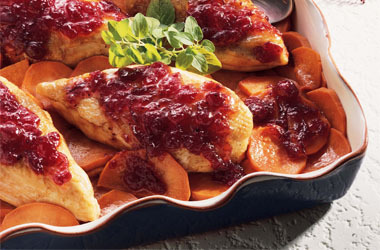 Pour cranberry sauce over chicken and let simmer 1 to 2 minutes more minutes to glaze the sauce up just a bit. Serve over Steamed Rice or with a Salad and Vegetables.